The Wipers Times (2017 cast). 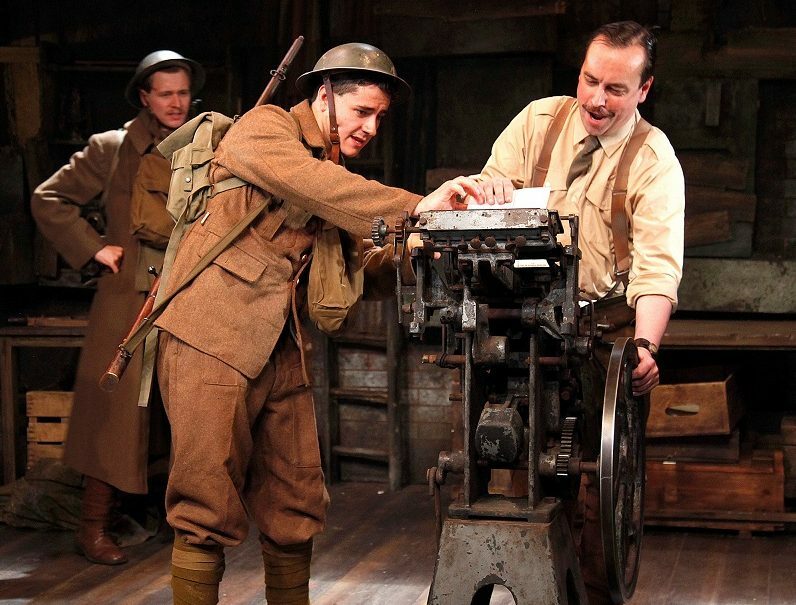 Ian Hislop and Nick Newman’s WWI satire – The Wipers Times – will tour the UK once again this autumn before returning to the Arts Theatre in London for a seven-week season. 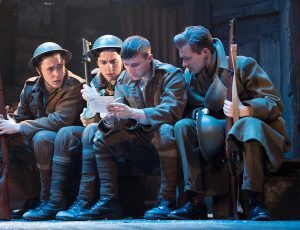 The Wipers Times, a stage adaptation of their award-winning BBC film, tells the true, and extraordinary, story of the satirical newspaper created in the mud and mayhem of the Somme, interspersed with comic sketches and spoofs from the vivid imagination of those on the front line. Ian Hislop and Nick Newman said: “The Wipers Times is on manoeuvres around Britain again. We look forward to sharing its remarkable trench humour with new theatre-goers around the country. “We are delighted it is not Journey’s End – but the tour will be all over by Christmas”. In a bombed-out building during the First World War, in the Belgian town of Ypres (mispronounced Wipers by British soldiers), two officers discover a printing press and decide to create a newspaper for the troops. Far from being a sombre journal about life in the trenches, they produced a resolutely cheerful, subversive and very funny newspaper designed to lift the spirits of the men on the front line. Defying enemy bombardment, gas attacks and the disapproval of many of the top brass, The Wipers Times rolled off the press for two years and was an extraordinary tribute to the resilience of the human spirit in the face of overwhelming adversity. The stage production premiered in 2016, 100 years after the Battle of the Somme and publication of The Wipers Times. This current run coincides with the commemoration of the end of WWI. October 15-December 1, Arts Theatre, London. Who has the dream Bottom for the Royal Shakespeare Company?